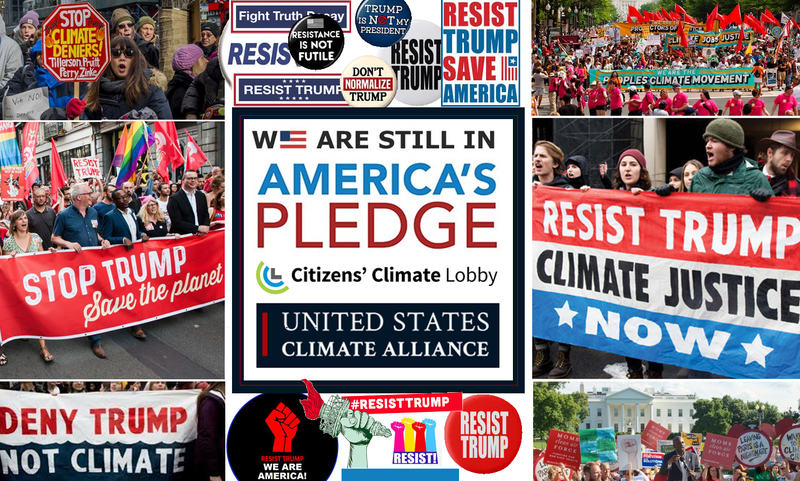 Climate concerns are at the core of an intensifying barrage of protests against Trump and his administration. In the face of the Orwellian nightmare of this government, the only sane response is resistance. There is no avoiding the fact that Trump's first 14 months in office have been an unprecedented disaster. Little more than one third of Americans approve of Trump and he is considered by experts to be the worst president in American history. Common sense dictates that Trump's rule must be challenged at every turn. The 2018 Institute for CSR program will take place Mar. 15 – 16, May 10 – 11, July 26 – 27, Sept. 20 – 21 in Washington, DC. Over the course of four, two-day sessions, participants learn from some of the field’s most innovative thinkers, authors, and practitioners, expand their professional networks learning alongside CSR peers from across the country, all while earning a Professional Certificate in CSR from Johns Hopkins University. 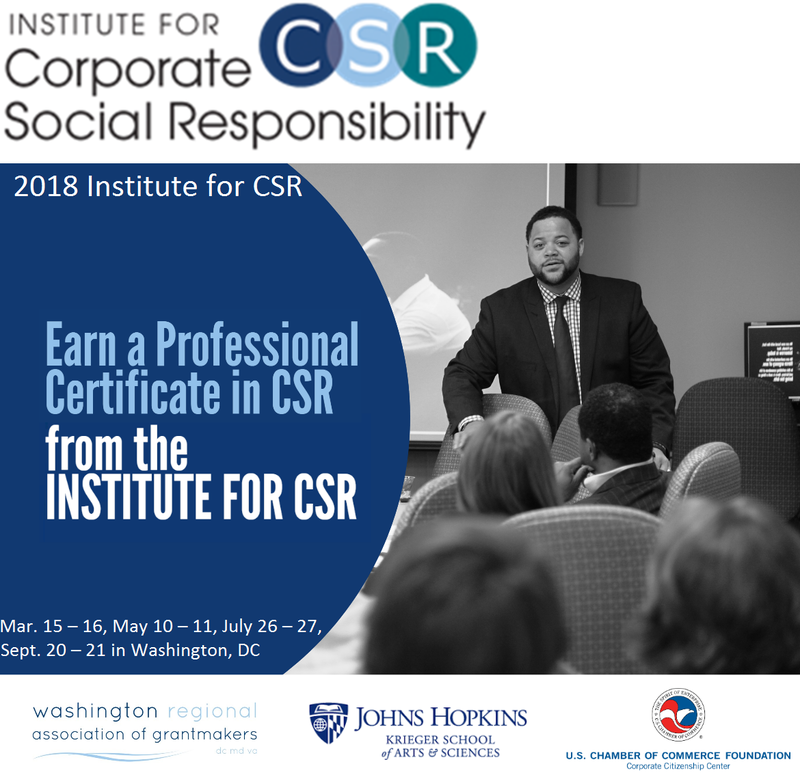 Coursework will focus on a wide range of topics, including CSR strategy, trends in philanthropy, employee engagement, ethics and sustainability, measurement, and communications. The 6th annual RBSNY will take place on March 26 - 27, 2018 at the Marriott, Brooklyn Bridge in New York, USA. Responsible business professionals from North America’s leading brands come together to discuss the impending paradigm shift and transformational change to business, industry, and society. 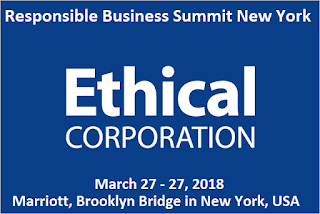 The Responsible Business Summit is USA's premier sustainability and Communications conference. They bring together the leading B2B and B2C companies to share their latest ideas and strategies. The 2018 sustainability conference will bring together the leading minds in responsible business to debate the key issues and opportunities in responsible and sustainable business. 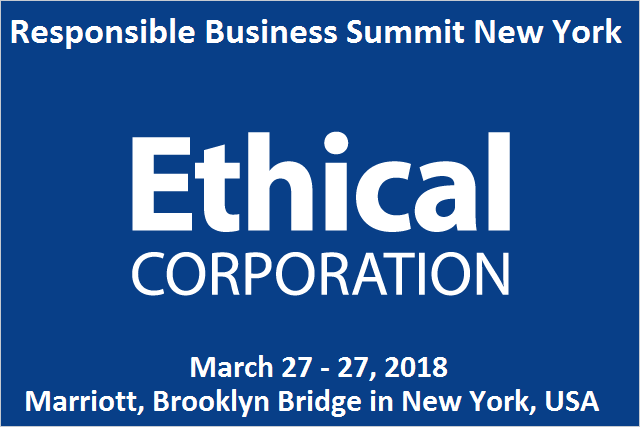 RBSNY is the only place in North America addressing the need to create genuine change to business, transform industries to last and create a long-term, positive impact on the environment and society. Its official, Trump is the worst US president in history. It is almost impossible to keep up with Trump's misdeeds, he is ending safeguards that protect Americans, he is dismantling government agencies and departments, and he is gutting government supported science. There are also 1001 small cuts that end government oversight and erode transparency. Trump's presidency has been a nightmare of Orwellian proportions. We still have many months to go before he is impeached. If Democrats fail to take control in the midterm election, those months could stretch into years. Environmental governance is essential to the management of the global challenges we face. This includes climate change, biodiversity loss, and ocean degradation. Here is a condensed summary of all that you need to know to be well versed on the basics of environmental governance. It includes definitions, lists, and summaries of many of the key features and issues associated with environmental governance. If you want to add something please do so in the comments section at the end. 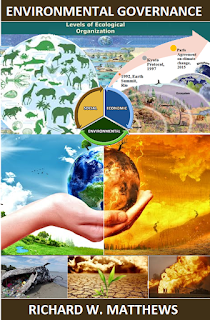 Environmental governance: A concept in political ecology and environmental policy that advocates sustainability (sustainable development) as the supreme consideration for managing all human activities—political, social and economic. Governance includes government, business and civil society, and emphasizes whole system management. To capture this diverse range of elements, environmental governance often employs alternative systems of governance, for example watershed-based management. 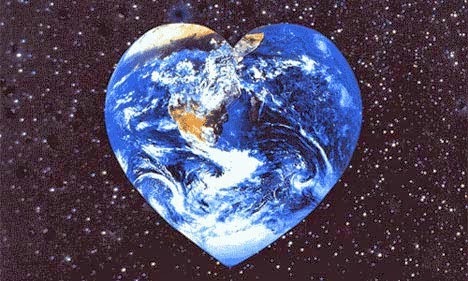 It views natural resources and the environment as global public goods, belonging to the category of goods that are not diminished when they are shared. This means that everyone benefits from for example, a breathable atmosphere, stable climate and stable biodiversity. By failing to invest in adaptation Trump has condemned future generations to unnecessary destruction. The longer we wait to invest in climate resilient infrastructure the more people will suffer and the more it will cost. 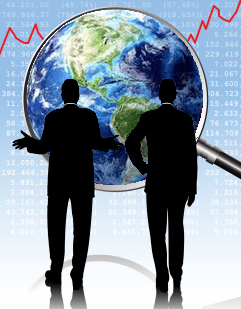 We can either pay for the losses as they occur or we can invest in the future and preempt calamity. The Trump presidency is accurately described as a nightmare. When his executive actions are viewed alongside his budget a clear picture emerges of an administration that is hell-bent on eroding environmental protections and killing climate action. 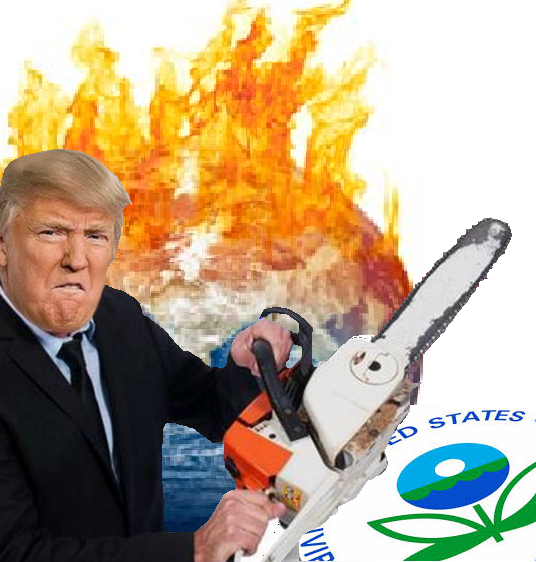 Trump's actions are compounded by his energy insanity which favors fossil fuels and undermines renewables. While the rest of the world is investing in the green economy Trump is cutting taxes. Trump is on the wrong side of history and at odds with other leading heads-of-state. On February 27th there will be a free information session about a cost-saving technological breakthrough in home heating systems. It will take place at the Holiday Inn in Point-Claire, Quebec. 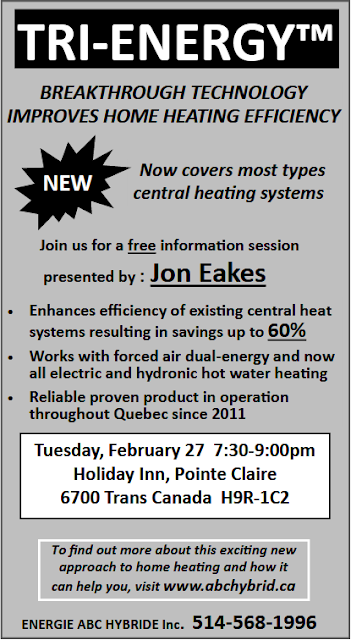 The presentation will focus on TRI-ENERGY™, a new low carbon heating technology that slashes both your heating bill and your emissions footprint. The TRI-ENERGY™ system takes radical efficiency to a whole new level. This system not only offers impressive savings it also provides increased comfort. When the cold weather hits exorbitant heating bills are sure to follow.The TRI-ENERGY™ system is a cost-effective heating solution particularly when compared to traditional heating systems. TRI-ENERGY™ technology costs a fraction of the price of a conventional furnace to install. It has no maintenance costs and it significantly reduces energy consumption and monthly heating bills. The TRI-ENERGY™ system maintains a constant temperature avoiding temperature swings and dry indoor air. By keeping your home at a stable temperature TRI-ENERGY™ saves you even more money by reducing wear and tear on your heat pump and your furnace thereby extending the service life. It also eliminates bone-chilling cold air during defrost cycles. On Monday, February 12th, Trump unleashed a budget that contains a barrage of environmental and climate insults. Like his first budget, the most recent funding allocation contains another volley of assaults against environmental protection and climate action. Trump has prioritized deregulation and reducing social welfare programs that support the nation's most vulnerable citizens. He wants to end climate action by eliminating more than a dozen programs. Trump wants to slash the budgets of the State Department and the Department of the Interior which oversees national parks, wilderness areas and other public waters and lands. Despite massive cuts, Trump's record setting $4.4 trillion budget would add $7.1 trillion to the national debt in the coming decade. This has prompted expressions of concern from the conservative Heritage Foundation and federal intelligence services. 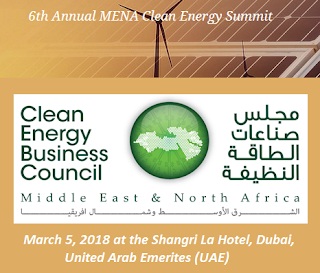 The 6th Annual MENA Clean Energy Business Council (CEBC) Summit will take place on March 5, 2018 at the Shangri La Hotel, Dubai, United Arab Emerites (UAE). CEBC is the pre-eminent organization representing the private sector involved in the clean energy sector across the MENA region. 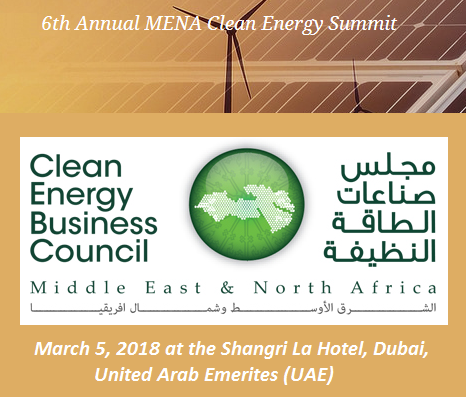 If you visit one event this year focusing on renewables in the MENA region in 2018, this should be the one. At this event you will gain knowledge from a diverse array of skilled and knowledgeable industry experts. Their wide range of experience, impressive career credentials and enthusiasm for the sector will provide an engaging opportunity for our guests to learn and develop their own knowledge and skills. Sustainable Brands Tokyo will take place on March 1-2, 2018 at the Hilton Tokyo Odaiba in Tokyo, Japan. This event is geared to drive better business results. Sustainable Brands is home to the premier global community of brand leaders who are tapping environmental and social purpose to drive innovation and deliver new business and brand value.Sustainable Brands events are subtitled, "REDEFINING THE GOOD Life".Discover how shifting consumer demands around the world are changing the 21st century economy. Benefit from new, fresh-from-the-field including research and case studies to help you deliver positive social impact while strengthening your brand's performance. Independent of the climate and environmental benefits, the economic potential of the green economy is staggering. The sheer scale of the opportunity warrants more attention from heads of government, investors and the general public. As quoted by the Guardian, Nick Austin, director of agricultural development at the Bill & Melinda Gates Foundation said, "We recognize that adaptation has been a vastly under-invested opportunity, [there is] an upside in economic opportunities for resilience to climate change." More than a dozen years ago the Stern review anticipated this opportunity. The report noted that climate action will, "create significant business opportunities, as new markets are created in low-carbon energy technologies and other low-carbon goods and services. These markets could grow to be worth hundreds of billions of dollars each year, and employment in these sectors will expand accordingly. Those who support sustainability cannot ignore the elephant in the room. 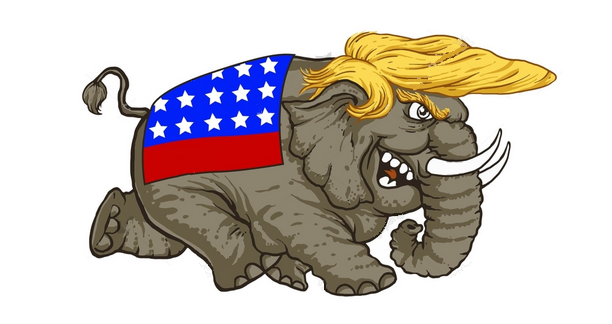 The elephant in question, is one Donald J. Trump. His racist vitriol, irrational penchant for environmental deregulation, and unbridled love for dirty energy are overarching impediments to the three pillars of sustainability. There was a time that corporate leaderships shied away from politics. However, in the precarious post-truth era of Orange-Potus, that is simply not possible. Leaders are stepping up to confront hubs of injustice even if they reside at the pinnacles of power. 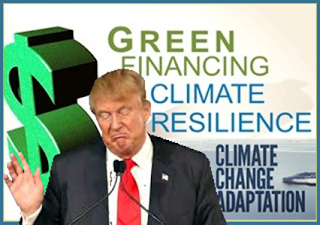 While governments around the world are investing in the green economy Donald Trump is providing massive corporate tax breaks. Trump's inept economic policies now appear to be wreaking havoc as evidenced by unprecedented stock market declines and the subsequent ripple effect around the world. 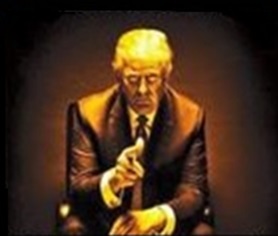 The Dow's 1,175 point plunge on Monday February 5th was the biggest decline ever and on February 6th markets around the globe are being pummeled. Trump's tax scam, his only legislative accomplishment, may be the cause of this market volatility. As explained by CNN's Matt Egan, Trump's tax cuts, "may be playing a role in the recent market trouble". 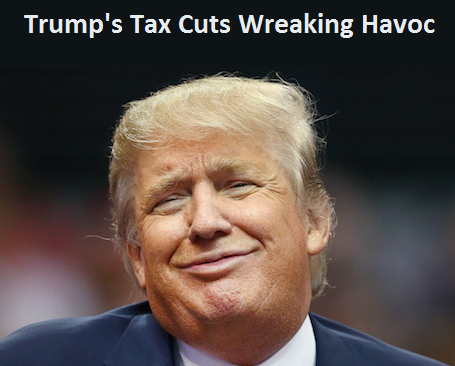 Months before the precipitous stock declines, Morgan Stanley warned that tax cuts could "overheat" the economy and backfire by causing stocks to, "boom then bust". This is precisely what we are seeing and it is only the beginning. An overheated economy will buoy inflation and interest rate hikes. 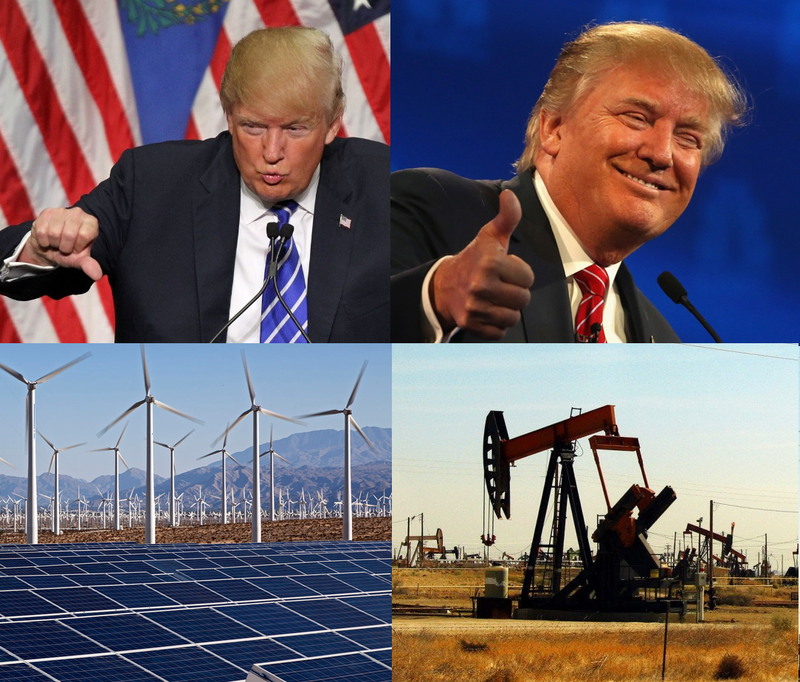 Donald Trump is taking another swipe at renewables by proposing the virtual elimination of research funding for clean energy. 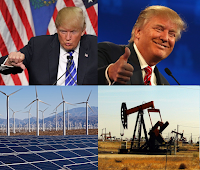 It is no secret that Trump loves fossil fuels a point he reiterated during his first State of the Union address. It is now becoming increasingly clear that he has contempt for renewable energy. He has emphasized this point recently by imposing tariffs on imported solar panels. Now Trump has followed this up with yet another salvo that seeks to cut funding for clean energy. A draft budget document obtained by the Washington Post indicates that the Trump administration wants Congress to reduce funding for clean energy research at the Energy Department by 72 percent. As explained in the title of the Post story this underscores the administration's marked preference for fossil fuels.